The Obama Administration is trying to sell a new set of twin narratives The first is that the charges and scandals surrounding his administration are phony, an obvious attempt at deflecting the mounting political damage being done to his excellency. The second is his pivot towards the economy. While there is nothing phony about the abuses of power the President’s administration has been involved in, there is plenty to question about the economic policies being put forth. The assessment of the current economic situation in the United States and much of the world has been bleak. Nothing that has happened so far this year to really changes that. In actuality, the economic data taken on a whole has been quite discouraging and leads to some unsettling conclusions regarding conditions worldwide. Some in the media is now catching up on what others have said for awhile, China is in big trouble. With a credit crisis beyond comprehension, a slowing manufacturing sector and large numbers of businesses surviving on government subsidies, the Chinese economy is a paper maché dragon with no place to hide from the coming storm. Europe for its part is still balancing on a knife’s edge and using delaying tactics to forestall paying for their past sins. Japan on the other hand is going down the Keynesian yellow brick road in hopes of finding a way back to prosperity. Much of the world is pining their hopes are on the United States. They are Looking to American to once again pull them back from the brink of disaster, unfortunately there is little upon which to hang such hopes. The U.S. is in a period of economic decline not seen since the Great Depression. For those who laugh at such a pronouncement it might be time to take off their rose colored glasses. Median household incomes have fallen 10% over the past 4 years. Today 4 out of 5 Americans are facing poverty and an uncertain future. For those lucky to find a job it is more than likely to be part time. Of the 753,000 jobs created since January, 557,000 were part-time. A grand side effect of Obamacare. It is also not surprising that, at a time when uncertainty is the main driver behind most business decisions, temporary workers are the fasting growing segment of the workforce. Another sign of the times is who is getting work. Being young has always been a strike against you but in an environment where taking chances is averted at all cost the situation has become critical. The following Federal Reserve charts tell the story. It appears for older less risky workers the economic downturn was only a hiccup but for those still trying to climb the ladder of success it was a disaster from which there has been no escape. It is no secret this so called recovery has been anything but, still the true impact on workers has been largely ignored. The real state of the economy for most is a mystery buried under a mountain of Federal Reserve cash and hidden behind mounds of unemployed who are no longer in the workforce. 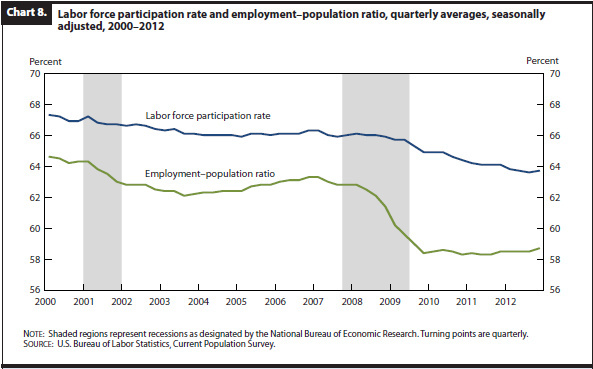 A fact reflected in the stubbornly stagnant labor force participation rate. The reality is only people doing well in Obama’s economy are the rich and those wishing to live off the charity of taxpayer money. The rich are benefiting from what is in essence is a transfer of wealth from the taxpayers to those with deep pockets. The driver of this wealth transfer has been a stock market driven by an out of control FED quantitative easing program. Robbing savings and pilfering retirement piggy banks, the program has bloated stocks and broker profit ratios. The proof of this is can be found in a comparison of GDP to stock prices. The real GDP average estimated growth is around 1.5%. Compare that to the year to date growth of the S&P’s at 18%, the Dow’s 18.5 increase or the NASDAQ 19% rise. Looking at the other end the economic spectrum the Department of Agriculture estimates that nearly a third of Americans now receive some sort of economic assistance. It seems President Obama’s pro-growth policies have had an effect, at least on the welfare and disability roles. Such are the facts behind President Obama’s phony economic recovery. When pressed on what needs to be done to correct the dismal economic performance of the last four years Obama’s Treasury Secretary, Jack Lew, said more of the same. His prescription is more shovel ready job spending on infrastructure, as if that hasn’t already been tried. Building Keynesian pyramids instead of addressing the fundamental issues facing American business is about all one can expect from this White House. In an act of delusion, he said when asked about reducing taxes and the regulatory burden on business instead, “that has been tried before and doesn’t work.” Apparently he believes the last 200 years of American history was a mirage and the real reality lies in the Obama alternate universe. It is unfortunate but the fact is the neither the world nor the people of the United States can expect great things from the American economy anytime soon. If China’s economy goes south, Japan slumps or Europe trips over its own policies there will be no Captain America to pull them from the fire, he will be too busy trying to just survive.